Dengue fever, also called as breakbone fever, is a debilitating, painful fever caused by dengue viruses spread through mosquito bite. Dengue fever is spread through the bite of a mosquito, Aedes aegypti. The culprit is a female mosquito that becomes infective after biting on an infected person. Once the infective female mosquito bites a person, the virus is spread to the victim. What are the symptoms of Dengue Fever? 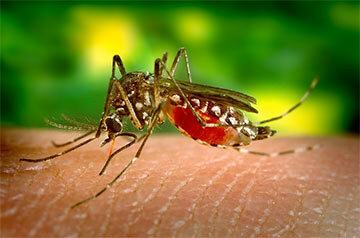 Dengue symptoms appears usually after 4-6 days after the infection and may last up to ten days. A skin rash may appear 2-5 days after the fever onset. Oft times, especially in the beginning, the symptoms are flu-like or any other viral infection. Rarely, chiefly when adequate care is not taken, it can proceed to sever complications. For example in Dengue hemorrhagic fever high fever can occur along with blood vessels and lymph nodes damage, nose and gum bleeding, liver enlargement and circulatory system failure. If adequate health care is not provided the dengue may proceed to massive bleeding, shock and death. This is termed as dengue shock syndrome. There is a higher risk of progressing to dengue hemorrhagic fever in individual with a weak immunity or people with a previous history of dengue. How to diagnose Dengue Fever? Dengue fever can be diagnosed with a blood test for virus antigen or antibodies for it. If you’re not living in a tropical area, but recently visited one, tell the doctor about it, so that the doctor can accordingly evaluate for dengue. How is Dengue fever treated? If you suspect dengue, especially during a dengue outbreak, use pain relievers like acetaminophen (paracetamol). You should avoid the use of medicines with aspirin (like Disprin) which has a negative effect on platelets and can worsen the bleeding. Drink plenty of fluids like fruit juices. If the situation worsen in first 24 hours after the fever went down, you must visit a hospital for checkup. Dengue complications may be on their way. Normally fluids replenishment is sufficient, but in severe cases platelet transfusion may be required. How can Dengue be prevented? Sadly, no vaccine has been discovered for dengue yet. The best method of prevention is to prevent the mosquito bites, especially if you live in a tropical region or traveling one. It can be done on two levels, one, protecting yourself, second, keeping the mosquito population in control. Use mosquito repellents even when indoor. When outside wear clothes with long sleeves and long pants with socks. If possible use air conditioning indoors. Whenever possible, avoid going to thickly populated residential areas. Keep the windows and doors closed and make sure there are no holes in them. Use mosquito nets if the area is not screened or air conditioned. At the first sight of symptoms visit a doctor. Get rid of any place where mosquitos can breed. Don’t let water collect however small it may be, clean or dirty. Stagnant water serves as perfect breeding ground for mosquitos. Unclean water coolers, abandoned water tanks, old tires, boxes or other junk with collected rain water are such breeding grounds. Why common people must know about Evidence-based Medicine? Will Smartwatches Like the Apple Watch Take Over Men’s Wrists?